Mexican Bun ( Aka Roti Papa) has once become a fad in Asian. Last 2 years it has come to Brisbane. It does not really create a huge fan kind of thing in Brissie . However we do see more of the Roti Papa shop set up in few more suburban. When it first started to take it 1st step in Brisbane, the shop was given out free bun for a day. One of a close bro of us , went to grab some for me and my love one. I have no idea the bun has coffee in it and happily take a bite. There gone the sleep of my night. 2nd time when he grab another one for me ( simply can not resist the fragrance of the bun) , I thought it will be smart to have this in the morning so it will not affect my sleep. Well it turns out I have a hyper heart beat for the whole day and it make me feel nausea . The powder of caffine!! 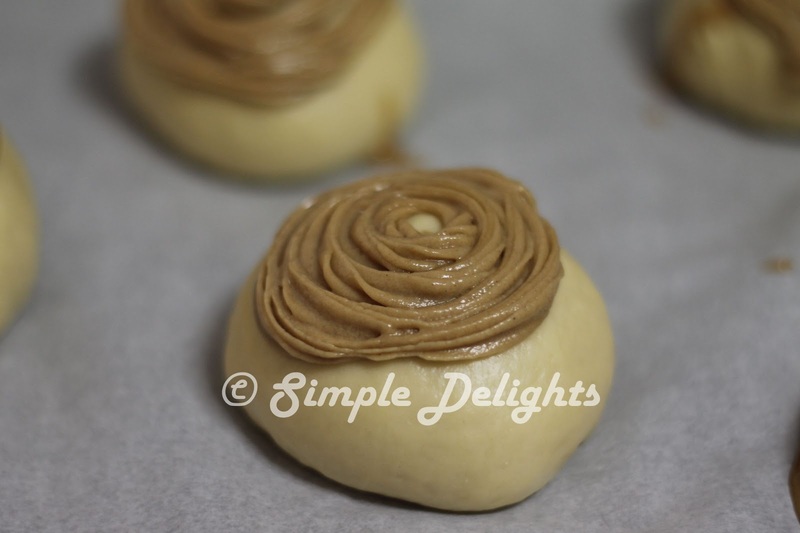 When I started my bun journey , I told myself why not give this a try, I can improvise the recipe and suit it to my liking and instead of making a full strength coffee version , I can do a mocha version ^^ . So here waw la is the recipe I adapt from HappyHomeBaking. 1. Put 25g bread flour in a saucepan, add 125ml water+milk , mix till smooth. Make sure there are no lumps of flour. 2.Cook over medium to low heat stirring constantly with a hand whisk to prevent it from burning. The mixture will start to thicken within 1 to 2 mins. It is ready when you see a visible line is form with each stir you make with the hand whisk. Another test will be , use the back of the spoon to touch the cook dough and draw a line , there will be a clear line and the dough will not flow back . 3.The 65degC tang zhong is ready. Immediately transfer the hot tang zhong into a bowl and cover it with a cling wrap, make sure the cling wrap sticks onto the surface of the mixture. This is to prevent a film from forming on the surface. Cool completely before using it. I prepare the Tang Zhong overnight and put in the fridge , before using it take it out to cool it back to room temperature. 1. Mix instant coffee powder and coco powder well and dissolve with warm water, mix in bailey cream and leave aside. 2. Cream the butter with caster sugar, until light and fluffy. Add the beaten egg one tablespoon at a time, beat well after each addition , add in the coffee mixture gradually alternate with the beaten egg . Make sure each incorporation is well mix and no cuddle is form. 3.Sieve over the cake flour. Mix with a spatula until just combined. Spoon the topping into piping bag fixed with pipping nozzle (round tip). Let the topping chill in the fridge until later. Have the topping out from fridge about 5~10mins earlier before use to allow the topping to soften a little. 1.Place the wet ingredient egg, milk, tang zhong (84g) in the mixer follow by sugar, salt, bread flour, cake flour. 2. Make an indentation on the flour and add in the instant yeast. Beat with low speed to make sure all ingredient incorporate well about 5min (It depend how powerful your mixture is ). Increase speed to medium. 3.After about 10mins of kneading, add in the 22g of butter. Increase the machine to high speed and continue to knead another 20min . The dough should form be elastic dough and that passes the window pane test. 4. Remove dough from the mixer shape into a smooth round. Place dough in a lightly greased mixing bowl, cover with cling wrap and let it proof for about one hour or until double the size. I put a warm water in my oven and have the dough sit in there to proof. 5. Remove the dough from the bowl and give a few light kneading to press out the gas in the dough. 7. Shape the bun into round shape let it rest on the lined baking tray. Space doughs two inches apart to allow them to expand. 7. Cover with cling wrap and leave doughs to proof for the second time in about 30~40mins, or until double in size. 8. Preheat the oven at 175C . 10. Bake in pre-heated oven at 175C for 15 mins or until golden brown. Remove from oven and transfer to wire track to let cool. It actually smell really good during baking and we did not leave it cool too long and have a bite while is warm. The bun is soft and with the butter in it , is just not satisfied with one bun. The coffee contain is not high in this recipe therefore you have the coffee fragrance but not the taste of it. I have make this bun quite small which is not a good thing, we just tend to take more than we should compare to a portion of normal bread . As this bun is small and the version is more on chocolate then coffee , I told my love one I will name this Roti MeiMei ( sister) instead of papa ( Father) . Of course sharing is caring , I share some to my close friends and the verdict - can we have a bigger bun and more than one for breakkie please next time ^__^ . The heart of the chef melted at this point .